The Goodyear Building is a nineteenth-century industrial building that our team transformed into a live/learn community. Spillman Farmer envisioned the building not only as an industrial relic, but also as an exciting contemporary space that could bring student residents and the campus arts community at Dickinson College together. The Goodyear Building was originally constructed in Carlisle, PA in 1891 as a shoe factory. It remained an industrial/warehouse building – under several shoe manufacturer owners – for nearly 90 years, until it was acquired by Dickinson College. As part of the campus, The Goodyear Building housed the College’s Physical Plant and provided storage for surplus library books. When approached about repurposing Goodyear, Spillman Farmer envisioned the building not only as an industrial relic, but also as an exciting contemporary space that could bring student residents and the campus arts community at Dickinson College together. The project includes 32 apartments that can house approximately 180 students in two-, three-, four-, and five-bedroom configurations. 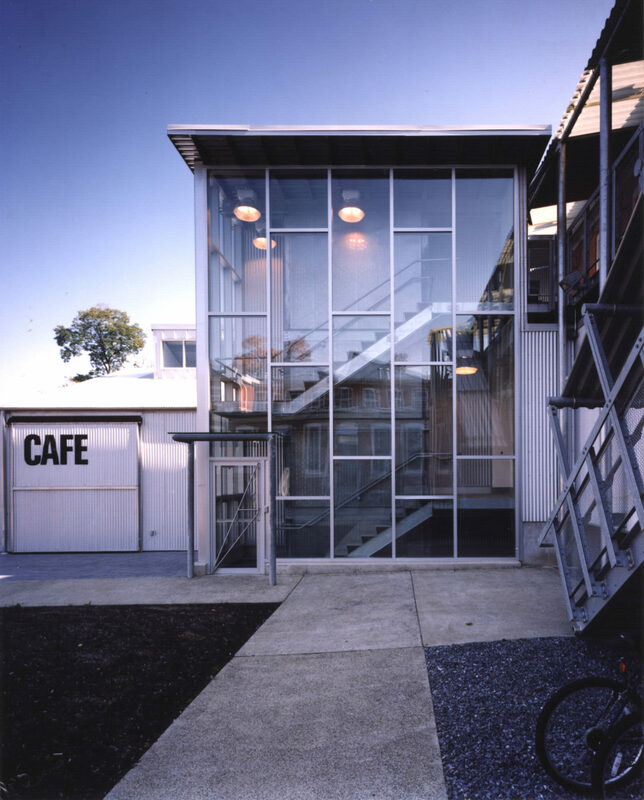 In addition to the residence spaces, the building also includes community gathering spaces, such as a café, and studios for the creation and display of art. The interior is specifically designed to evoke the building’s former use as a warehouse space and physical plant by purposefully exposing its structural elements including heavy-timber framing and masonry. Industrial finishes such as corrugated ceilings and exposed pipes also contribute to the aesthetic. The exterior retains the building’s brick exterior and multi-pane windows while incorporating the industrial finishes similar to those applied on the interior, including galvanized extruded-metal stairways, corrugated metal deck roofs, and expanded metal mesh railings. This award-winning project vaulted a good portion of the College’s residential housing stock from the mundane to the cutting edge, again, thanks in large part to Spillman Farmer’s unique approach to our needs…Spillman Farmer produces what the College needs, when the College needs it, without fail.